Some say the game of power is as old as mankind itself but never before has it been more sinister or deceptive. Against his will, 22-year-old Axel is admitted to the highly esteemed Eagle King’s Academy. Together with 11 other students, he’s primed to become one of the most influential and powerful leaders of his time. Yet behind the Academy’s luxurious and polished façade awaits a world of lies, ambitions and dark secrets. To graduate, the students must be willing to sacrifice everything they hold dear. But Axel isn’t the only one at odds with the Academy. An enemy lurks in the shadows, and soon Axel finds himself caught in the crosshairs of a very sinister game of power. Twelve years earlier, Sarah Wangai entered the prestigious academy with hopes of changing the world for the better. No one has heard of her since, but her story is eerily similar to Axel’s. 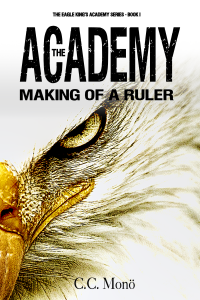 The Academy: Making of a Ruler is the first book in the Eagle King’s Academy Series. A few years after Sarah Wangai vanished, Hayato Sano graduated from the Eagle King’s Academy. Two days later, he disappeared. Axel faces his greatest challenge yet when he and his fellow students attend the most extravagant party of the year – the Diamond. The students are forced to test their skills against the world’s foremost elite. But the games Axel play turn treacherous, and soon he finds himself playing for his life. Meanwhile, The Box is stepping out of the shadows. No one knows they’re coming, no one but Axel. 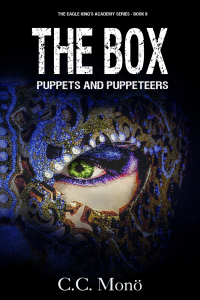 The Box: Puppets and Puppeteers is the second book in the acclaimed Eagle King’s Academy Series.